There is nothing, absolutely nothing, half so much worth doing as simply messing about in boats. Until you drop your keys overboard, then it all becomes a bit of a chore. Next time, attach the Waterbuoy and, within seconds of hitting the water, environmentally friendly gas will automatically inflate the reinforced rubber balloon to save your keys from being lost in the gloomy depths. You don't have to stop at keys either - clip the Waterbuoy to any item weighing up to 1kg and it will happily float on the water for 24 hours. If you're going to drop something in the river, chances are you'll do it in the dark (it's the law of the sod - or something like that) which is why the crafty inventors have included a blinking LED light in just the right place to make your floating gizmo visible from up to 250m away. 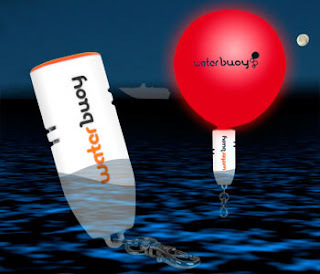 This makes the Waterbuoy the world's first and only miniature floatation device that's visible at night.